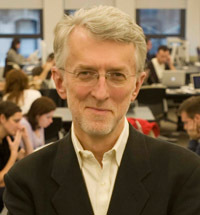 Highly respected blogger, media commentator and thought leader, Jeff Jarvis is the proprietor of one of the Web’s most popular and respected blogs about media, Buzzmachine.com, and author of What Would Google Do? (Collins). He also writes the new media column for the Guardian in London. He was named one of 100 worldwide media leaders by the World Economic Forum at Davos in 2007 and 2008, and he was the creator and founding editor of Entertainment Weekly magazine. Jarvis has been a consultant and guru to companies that range from The New York Times Company to General Motors, and is a frequent keynote speaker and business leadership speaker for companies and at conferences around the globe, most notably at the World Economic Forum at Davos. He has appeared frequently on TV and radio, including ABC’s 20/20 and World News Tonight, CNN’s Reliable Sources, MSNBC (where he was a regular blog contributor), Fox News, Oprah, PBS’ News Hour, CNBC’s Kudlow & Company and The Big Idea with Donny Deutsch, the BBC, Sky News (where he is a regular contributor), and public radio’s Marketwatch and Morning Edition. Jarvis has unpacked the strategic and operational principles that have underpinned the Google’s phenomenal success and applied them outward. 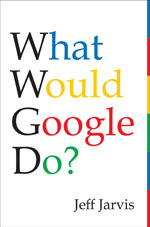 In talks, he provides an indispensable manual for survival and success and asks the most important question today’s leaders, in any industry, can ask themselves: What would Google do?